On March 9, Malalai met with the staff members of Congressman Russell Feingold, a Democrat from Wisconsin. In the photos she is seen with his chief Wisconsin staff person, Katie Crawley. Malalai also spoke with Feiengold's chief foreign affairs staffer, Gray who was on speaker phone. She discussed U.S. support for Afghan warlords, foreign aid not reaching intended recipients, problems faced by Afghan women, U.S. and NATO troops, and and reported there in the U.S. detention centers in Afghanistan and many other issues with them. 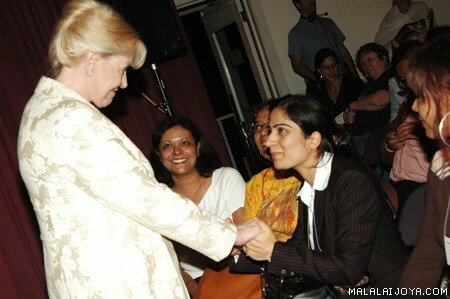 Joya with a large number of Afghans who received her warmly in California. Joya delivered a speech in a public meeting and answered questions. Hungama and her husband, Mr. Wais Soror, presented a special concert for Joya. Mar.18: Over 200 people came to hear Malalai speak at the Central Library in Santa Barbara, CA. Mar.17: Joya meets with U.S. Congresswoman Lois Capps in Santa Barbara. Mar.17: Joya with Mayor Marty Blum (right) - who welcomed her in Santa Barbara Press Conference. Briana Lawrie (left) was the main organizer or her events in Santa Barbara. Malalai with her supporters in Santa Barbara who worked hard to organize events for her. Joya gives interview to Steve Zind from Vermont Public Radio. With Daruish, great freedom-loving Iranaian singer. Malalai Joya with Afghan poet Raziq Fani, he came from a far away just to meet her in person. Interview with a local radio.